So carrot ribbons are pretty damn sweet. 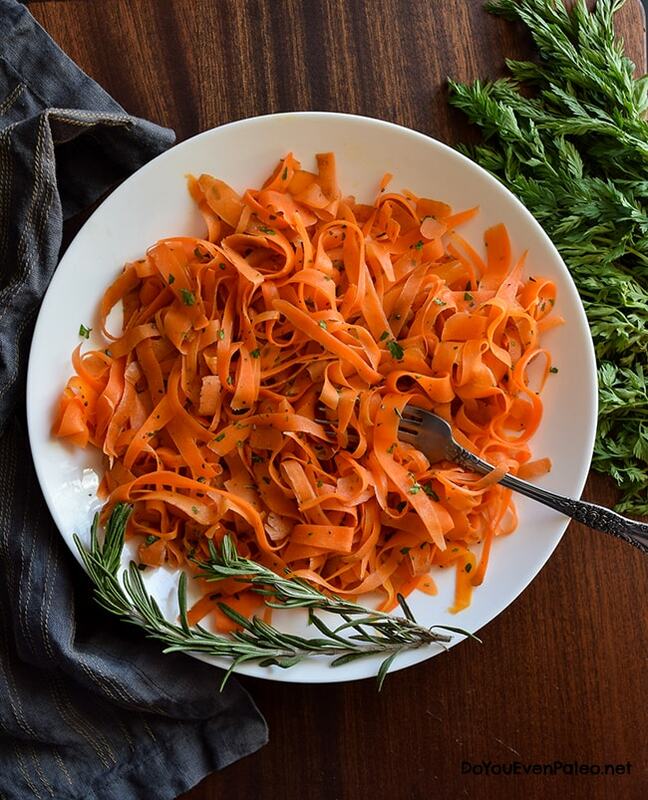 And carrot ribbons with rosemary butter are even better. 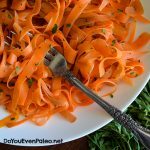 Originally I wanted to use spiralized carrots for this recipe (and when you make it, you totally can), but I don’t have a spiralizer at the moment. I chose not to let that stop me from recipe testing, though…and then I fell head over heels in love with carrot ribbons. Eventually I would like to get a vegetable spiralizer, but with numerous other more pressing purchases I’m saving up for, it’s on the back burner. 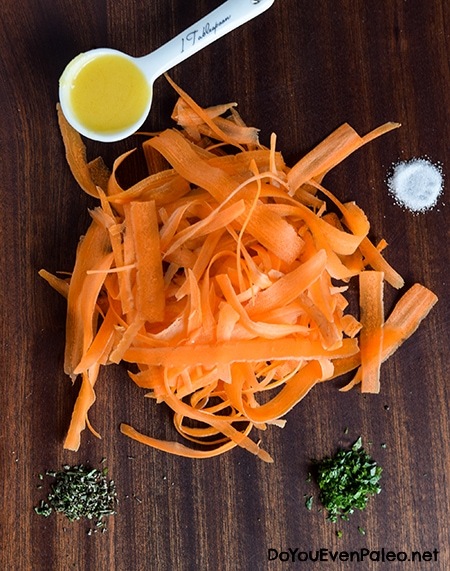 Making carrot ribbons is really quite simple. Maybe slightly more time-consuming that using a spiralizer, but the difference is very minimal. You’ll need a vegetable peeler (This is the one I’ve got. I love it. Rust-free, inexpensive, and super sharp). Got one? Good. Now just use the vegetable peeler on the length of the carrot. You should get a long ribbon of carrot. (If you screwed this up, I really don’t know how I can help you. Sorry!) Repeat the process until you’ve got a bunch of carrot ribbons and you can’t peel the carrot anymore. I laid the carrot flat on the counter while I peeled it – much safer than holding it. And then you’ve got all these lovely ribbons! The next step is to steam the ribbons. If you don’t have a steamer basket…I’ve got another kitchen hack for you. I’m full of ’em. To make an impromptu steamer set-up, just put a metal colander over a boiling pot of water. It doesn’t have to fit. My colander is gigantic and only the bottom 1/4 rests on the rim of the pot. I then put the lid of the pot over whatever I’m steaming in the colander to hold the steam in. It’s not perfect, but it works! 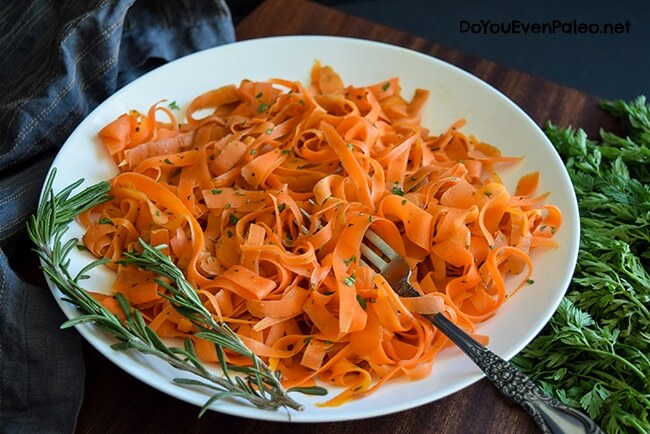 You don’t need a spiralizer to make these lovely carrot ribbons with rosemary butter! 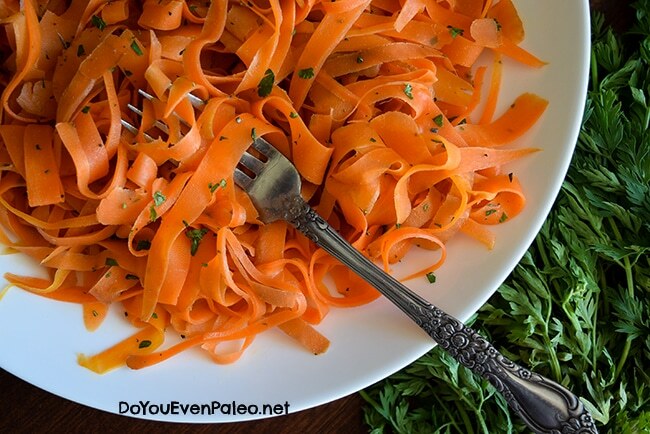 This recipe is paleo, AIP, vegetarian, and Whole30 friendly. Fill a saucepan with 1 inch of water. Bring to a boil. Place carrot ribbons in a steamer basket (or metal colander) and place in the saucepan. Cover and steam for 3 minutes or until crisp-tender. Since the ribbons are so thin, it doesn’t take long to steam them! If they steam for too long, you’ll end up with carrot mash. 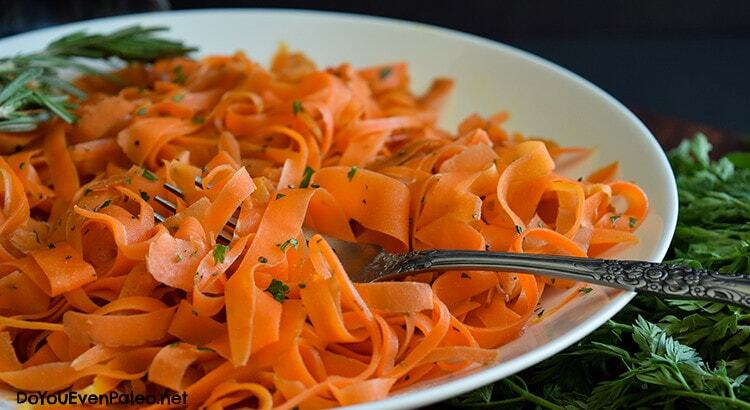 If you spiralize the carrots, the steam time will increase since the noodles are thicker. Meanwhile, in a small bowl, combine the remaining ingredients. Add steamed carrots and toss to coat. Serve immediately. Looks beautiful, simple & perfect! Why thank you! 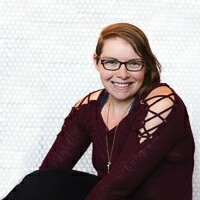 I’m very pleased with how the pictures turned out for this one! This looks delicious! I can’t wait to try this with the carrots from my garden! Pingback: Scarborough Fair Carrot Ribbons with Shrimp - Pinch me, I'm eating! This sounds delicious, and I am going to try it! But, you have such a fun and informative way of writing, why do you feel the need to punctuate it with cursing? Darby, I appreciate you stopping by! I simply write the way I speak for the most part. That’s my personality, and I don’t feel the need to censor it for the Internetz. Looks and sounds fabulous! I am wheat, grain, gluten, dairy, nut and suagr free. Need aome new recipes! Thank you! This is one of my most popular recipes and there are many, many variations you could use. Hope you like it! Idk where you are, but I will find you. And I will hug you. Just made this! Delicious and simple thank you so much!!!! Really yummy and a nice sunny addition to the plate! Thanks! I made these with a bunch of carrots of assorted colors, and they were pretty as well as tasty. I roasted the seasoned ribbons in the oven at 400 F as I had various things cooking on the stovetop. Great idea! Thanks. This would be lovely with different colored carrots! Love the idea. How long did you roast them? I’m not sure now, but maybe 20 to 30 minutes. I just kept tossing them and sticking them back until they seemed done. I have the dumbest of dumb mobile phones, or I would have been happy to take a photo of the carrots. They were quite nice looking, if I do say so myself. I will definitely fix them again the next time I get a nice bunch of multi-colored carrots. Are the steps the same if I need to prepare this the night before so it serves as lunch the next day? Hi, Delia! I think this is best if the rosemary/butter or ghee mixture is tossed in right before serving, but I think you could still make it the night before and heat it up just before serving! Don't subscribe All Replies to my comments Notify me of followup comments via e-mail. 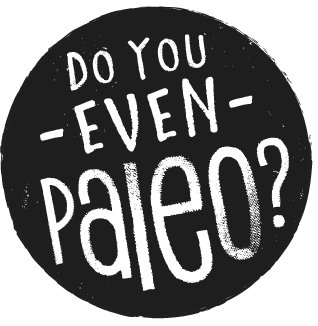 You can also <a href='https://www.doyouevenpaleo.net/comment-subscriptions/?srp=1381&srk=87505361eee98908ddf6ccb8681f50d6&sra=s&srsrc=f'>subscribe</a> without commenting.